Muzzies Crokinole is located in Forest Glade, in Nova Scotia’s Annapolis Valley region. The man who’d left home in his youth to study and work in another part of the country, and returned only years later to attend the funeral of his beloved grandfather and claim the crokinole board they’d spent so many hours around during his childhood. With tears in his eyes he revealed that he never got the board. He had stayed away too long and it disappeared in the mean time. The family who have enjoyed a big family tournament every Christmas season for years -elaborate trophy and all – and now needed more boards for their growing numbers. The lady who came with her daughter to buy a new board to surprise her sister. They had grown up playing crokinole in their home, next door to the family business, almost below Blomidon’s red bluff. Generations of their family were coopers, making wooden barrels for shipping Annapolis Valley apples and Bay of Fundy fish to consumers all around the world. She and her sister, who is in her nineties, still “play a few rounds” almost every day of the week. Often, their brother is able to join them as they compete, laugh, and talk of the old days. The guy who grew up on a northern prairie farm, who had fond memories of competitive play in the one room school house during long cold winter lunch breaks, when it was way too cold to stick their noses outside. 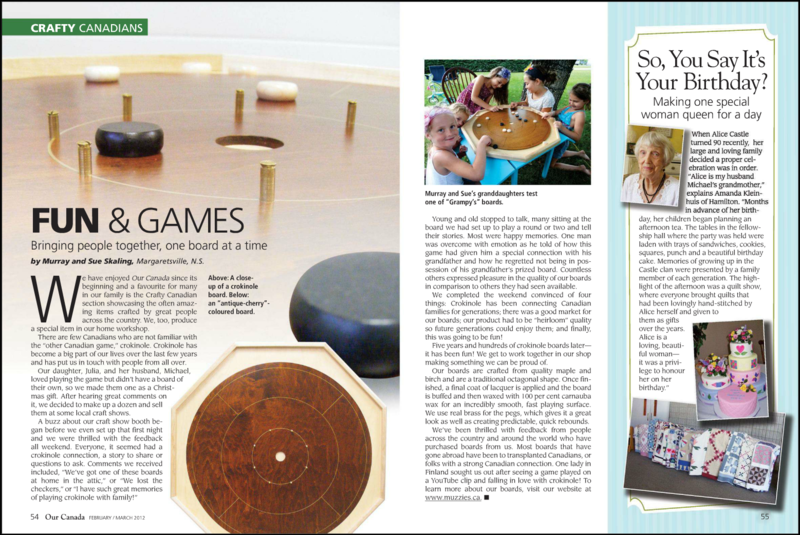 The retired farmer who spoke fondly of the community highlight of the year in his eastern Ontario home- the spring maple syrup “sugar off” celebration, and the crokinole boards lined up in the community hall for the tournament that was a big part of the special weekend. The fellow who’d honed his impressive skills playing solitary crokinole for endless hours one winter, while living alone on an island in the Bay of Fundy, tending a lighthouse. The grandfather who wanted the nicest board he could find to teach his grandson to play on – he had grown up in a home where money was scarce. His father drilled holes in the kitchen table for the “croke” hole and to place nails in for pegs, and each evening would draw circles with chalk before the games began. Some of Murray’s best crokinole memories are of playing with his own grandfather, who had his own unique “thumb” shot. (He had lost all the fingers on his right hand many years before in a sawmill accident – but was almost unbeatable!) and of teaching Sue to play, then their children, and now grandchildren. 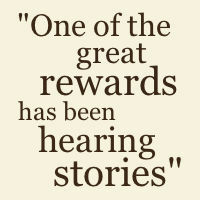 part of new memories they are hearing about all the time. Parties, tournaments, gameclub nights, new traditions started with family and friends in locations all over the world, gathered around a Muzzies crokinole board. Boards can be purchased online at muzzies.ca, or locally at their shop in the Annapolis Valley, NS. What is the meaning of the board names? We chose Annapolis, Fundy, Blomidon, and Melvern because we live near the Bay of Fundy, on the mountain that forms the northern boundary of the Annapolis Valley. At the eastern end of our mountain, Blomidon, a clay bluff, juts out into the Bay, separating it from the Minas Basin. The little community where we raised our family is called Melvern Square. It is a beautiful part of God’s creation that we get to call home.